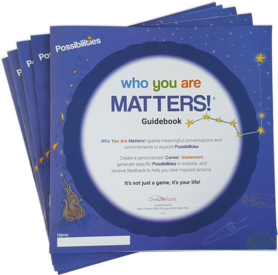 An interactive board game, co-authored by Rich Feller & Mark Franklin, is one of OneLifeTools, Inc. interventions ground in theory and driven by a life and career clarification process, an intentional exploration process, and on-line storyteller technology. Who You Are MATTERS! sparks meaningful conversations and helps participants connect the dots in their professional and personal lives. Learn more and check-out Facilitator Training opportunities here.